Most people use e-cigarettes as a “safe” alternative to cigarettes, because the “vaping” mechanism eliminates a lot of the smoke that builds up tar in the lungs. 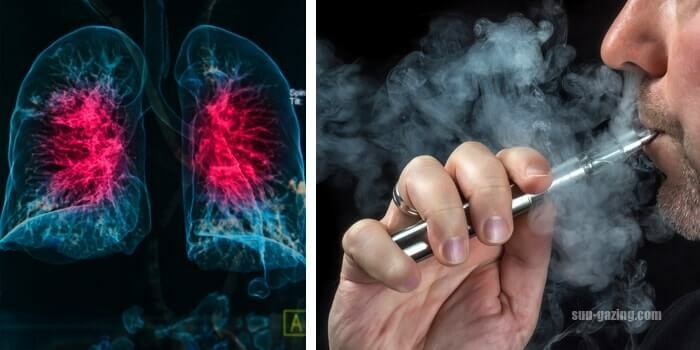 However, a recent Harvard study has shown alarming links to a serious lung disease, and there is now deep concern in the medical community linking e-cigarettes to a disease called obliterative bronchiolitis, or “POPCORN LUNG”. In 2000, an investigation into the severe form of bronchitis being found in microwaveable popcorn factory workers, led the Centers for Disease Control and Prevention to conclude that the toxic chemical “Diacetyl” was responsible, found in 39 of the most popular brands of flavored e-cigarettes! Very often Popcorn Lung, an irreversible and often life-threatening disease, gets misdiagnosed. Although no longitudinal studies have yet been done, given how new e-cigarette smoking is, we do know that Popcorn lung can be devastating. Let us know your thoughts after watching the footage below.